The Mapmaker Chronicles are middle grade chapter books by A.L.Tait, published by Lothian, an imprint of Hachette, Australia (2014.) Find out a little about each book, or scroll down to Books 1-4 to read my reaction to the series so far. The King is determined to discover what lies beyond the known world, and has promised handsome prize to the ship’s captain who can bring him a map. To do that, they’ll need mapmakers – and 14-year-old Quinn is shocked to be one of the chosen. While his older brothers long for adventure, Quinn is content with a quiet life on the farm, but when word of his special talent gets out, he has no choice but to pack his bags and join the mismatched crew of slaves and stowaways on board the Libertas. Nobody knows what lies off the edge of the map, but Quinn is about to find out that it's more than anyone bargained for . . . In Book 1, Race to the End of the World, we meet Quinn, the main character for the whole series. Quinn is a hero many will relate to - someone who loves to read and learn, not over-flowing with confidence, and happier out of the limelight. But when he is chosen to be a map-maker, he is thrust into a life he could never have imagined. He must draw on his abilities and inner resources, become resilient and physically strong. His friend, a girl named Ash, is brave and very determined - both qualities she needs when she decides to stow away on Quinn’s ship in Book 1. In the second book in this thrilling series, Mapmaker Quinn is far from home in an exotic land filled with dangerous creatures and ruthless enemies. When he is betrayed by someone close to him and comes face-to-face with blood-thirsty pirates, he has to decide once and for all who is a friend and who is a foe . . .
Is this the end of the race for Quinn - or just the beginning of another incredible adventure in THE MAPMAKER CHRONICLES? In Book 2, Quinn and his party explore a different part of the world, and eventually Quinn finds himself in a small wooden cage aboard the Black Hawk. I loved that despite the way everything seems stacked against him, Quinn never gives up hope. There’s so much drama and excitement at times, kids will need to remind themselves to breathe! Quinn, Ash, Zain and the crew of the Libertas are racing against the clock to get back to Verdania before the King's deadline. Will they make it in time? Will Quinn complete the first map of the whole world? Will Zain bring back enough treasure to satisfy the King? Will they win the race to the end of the world? Or will their enemies stop them from getting back at all? In Book 3, the tension seems to ratchet up even more. There are new lands to explore, new treachery to deal with, and some very serious setbacks. Zain, the enigmatic Libertas captain, needs rescuing and Quinn needs all his wits, his resolve and his maturity to come to Zain’s aid. In book 3, Breath of the Dragon, we saw the end of the race between the ships’ captains and their mapmakers, but in Book 4, Quinn must put to sea again. This time he has two of his older brothers with him, but again he must face treachery and then try to survive many challenges. There’s lots of tension and excitement as is usual in The Map Maker Chronicles books. Young readers will be pleased to see that it looks like Quinn and his friends might be back in a fifth book for the series. As an adult who wants to encourage children to read, I read STACKS of children’s books. If I don’t like a book, I don’t review it, but I try to look at a book from a child’s point of view and find the merit a child might see. 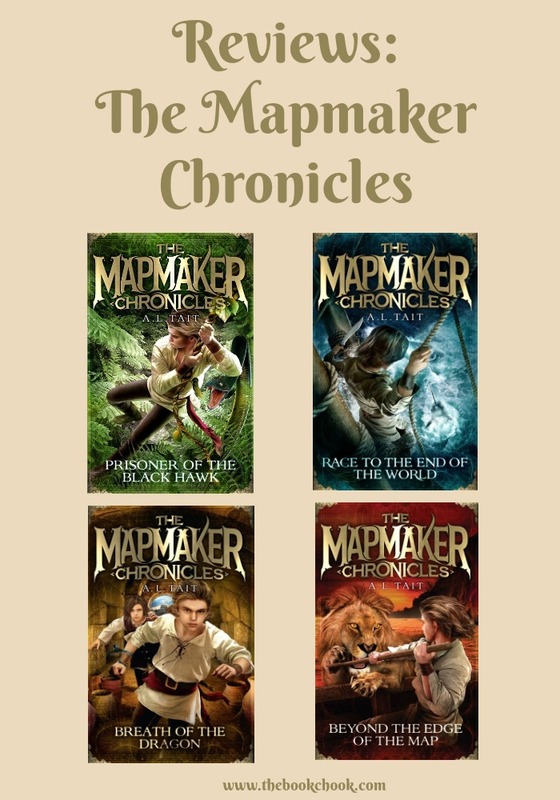 I think kids will really enjoy The Mapmaker Chronicles but I think they are books that can equally be read by adults. Yes, the sentence structure and language used may be simpler than in an adult book, but there is no dumbing down. These are rattling good yarns, well-told. The main character, Quinn is a strong point-of-view character, and we mostly see the story through his eyes and experience what he experiences. But other characters are well-drawn too. There’s Zain, captain of the Libertas, and Quinn’s mentor; Ajax, a fellow map-maker and friend of Quinn’s; Ira, arrogant and untrustworthy; and lots of villains who are both cruel and treacherous. I love the way Tait allows her characters to speak in modern vocabulary and expressions kids will recognise, because I have read books where the use of dialect and archaic speech has slowed a book right down. On the other hand, I also love the way readers can look through a startled character’s eyes, and experience the mind-boggling wonder, to them, that is a volcano or an elephant. I would recommend these books to kids 8-12 who like adventure, who love to enter a detailed, believable fictional world, who like action, flashes of humour, quests and moments of nail-biting tension. Suggest The Mapmaker Chronicles too to children who like a series - there’s something very comforting about understanding main characters and growing with them over the course of several books. For educators, there are useful resources at A.L.Tait’s website. Also - Have any Stage 3's read this and enjoyed? Hi Vanessa, I am not a librarian and not in schools any more so am going with my gut feeling and experiences as a lit loving teacher in my reviews. Ash, a girl, is definitely a main character and is one of Quinn's friends. I believe both boys and girls will enjoy the series, the way both genders have enjoyed other classic adventure series. If I were a TL, I would suggest it to any kids who liked books like Feinberg's Wicked's Way, or Fussell's Samurai Kids series, or just adventure, excitement and tension. I would also say that though there is tension, there is no horror or too much scariness, if that makes sense. Definitely pitched at kids 8-12.